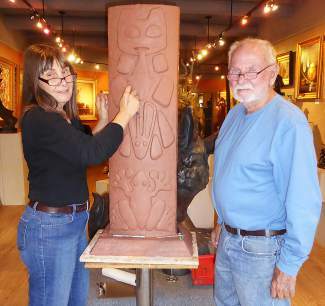 Artists Martha and Del Pettigrew will demonstrate their skills as sculptors and oil painters at Knox Gallery on Beaver Creek Plaza this weekend. What: Martha and Del Pettigrew. When: Artists will demonstrate their skills from 11 a.m. to 6 p.m. Saturday, July 2, through Monday, July 4. Where: Knox Gallery, 46 Avondale Lane, Beaver Creek Plaza. More information: Call 970-949-5564, or visit www.knoxgalleries.com. BEAVER CREEK — Knox Gallery on Beaver Creek Plaza is hosting renowned husband and wife artists Martha and Del Pettigrew in the gallery from Saturday through Monday. Open to the public, both artists will be demonstrating their skills as sculptors and oil painters from 11 a.m. to 6 p.m. each day. Martha Pettigrew, best known for her renditions of indigenous women in bronze, is equally adept with a paintbrush and oil paint. Her sculptures can be seen in the Hoffmann Commercial Real Estate Collection in Avon, which features three of her bronzes, “The Drummer,” “The Searcher” and “Coastal Spirits Monument.” Her bronzes are also in many other municipal, state and private collections throughout North America and as far away as Dubai. “If I have achieved my goal as a sculptor, the viewer will feel an emotional attachment and sense of pride, dignity and serenity with the subjects,” said Martha, who has been the recipient of numerous awards for her work. Born in Lincoln, Nebraska, Del Pettigrew’s first exposure to sculpture was when a neighbor formed a boys’ arts and craft club, held in a former chicken coop. There, his first sculpture was a wooden bas-relief of a mallard duck landing in a marsh. His interest in wildlife and domestic animals never waned. Pettigrew draws his inspiration from his experiences as a boy hunting and fishing and later observing wildlife in nature. Del’s bronze wildlife sculptures have been very popular among valley residents. Del also has a bronze in the Hoffmann Commercial Real Estate Collection in Avon, titled “Crossing the Tundra.” His larger pieces, mostly bears and birds, are found in private gardens, museum and municipal collections. Del also enjoys oil painting and is especially fond of figurative subjects. “Clients will enjoy watching Martha and Del and their unique approach with the creative process, from clay to finished form,” said art consultant Nancy Andresen. For more information about the show, call Knox Galleries at 970-949-5564 or visit http://www.knoxgalleries.com.